The parents of Jim Kinnu '48 sent their son to St. Pat's because they knew that the Christian Brothers would instill a sense of discipline in him. Jim spent almost three hours per day traveling by train from Downer's Grove to Saint Patrick Academy, always ending his day with a two- mile walk to his house. According to Jim, "The long commute was well-worth it." The most meaningful times for him were with Brother John Chrysostom, affectionately known as Little John "C," who was head of the Personal Improvement (P.I.) Club. His sermons always focused on living a Christ-like life with ethics and morals. Brother John "C" along with Brother Leo who taught algebra, and Brother Terence were the three teachers who stood out and left a lasting impression on this son of an Assyrian immigrant father. "The Brothers taught me the principles by which one should live. They taught life fundamentals - the importance of integrity, honesty and the importance of treating others how you would like to be treated." Jim carried with him the ideals that the Brothers instilled as he left Saint Patrick and went on to college and the military. Jim attended the University of Notre Dame for two years, and then transferred to UCLA where he graduated with engineering and business degrees. An R.O.T.C. scholar, Jim served two years in Korea before he began his 37-year career in the aerospace industry. Upon his discharge from the U.S. Army, Jim joined Lockheed Corporation where he worked for 17 years. He then went on to work for Rockwell International and finished his career with Northrop Grumman. His positions at these corporations included design and project engineer and manager, contract administrator, manufacturing, and company-wide program manager for various development programs. His proudest accomplishment of his career was being one of the founding members of the Stealth Fathers: those individuals who signed the patent for the U.S. Air Force B-2 Spirit Stealth Bomber. The B-2 is a low-observable, strategic, long-range military plane with the ability to fly to any point in the world within hours. Jim was appointed Vice President Program Manager upon the award of the B-2 Development Contract in 1981. For seven years Jim led the development efforts, major assemblies, technology and design to produce the B-2 aircraft. During the development of this project for the aircraft, Jim oversaw 35,000 people, many of whom could not talk about the project due to its classified status. Jim, once again, credits the Christian Brothers for teaching the importance of integrity while working on such a top-secret military project. On October 2, 2017, Jim addressed five science classes at St. Pat's, having travelled to Chicago from his home in California to do so. He spoke about his career, the B-2, and how St. Pat's and his faith has inspired him. Ever grateful to the Christian Brothers for "making him the man he is today," he has also generously included Saint Patrick High School in his estate plans. 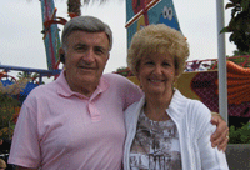 Jim resides in the Los Angeles area with his wife, Joyce. He has two daughters and four grandchildren who live nearby.